GRIDDLE IS 24" X 24"
This propane grill cooks 65 hamburgers or 126 hotdogs at one time! This high-traffic event propane grill is ideal for company lunches/picnics; restaurants; hotels; country clubs; catering; sales promotions; construction sites; church, school and sporting events; fire and police stations; annual reunions and much, much more! Features eight stainless steel burners and a compact design. This grill fits in a 6' - 8' bed of a standard pick up truck for ease of traveling. 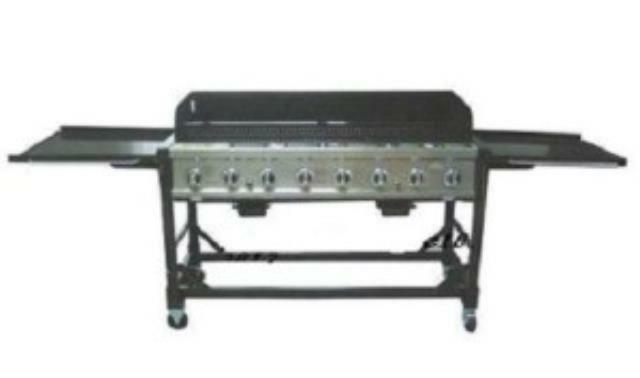 Assembled Size 109" x 25.8" x 43.2"
* Questions on our 8 burner propane grill 06 rentals? Please call us!